This volume strengthens interest and research in the fields of both Childhood Studies and Nordic Studies by exploring conceptions of children and childhood in the Nordic countries (Denmark, Finland, Iceland, Norway, and Sweden). Although some books have been written about the history of childhood in these countries, few are multidisciplinary, focus on this region as a whole, or are available in English. This volume contains essays by scholars from the fields of literature, history, theology, religious studies, intellectual history, cultural studies, Scandinavian studies, education, music, and art history. Contributors study the history of childhood in a wide variety of sources, such as folk and fairy tales, legal codes, religious texts, essays on education, letters, sermons, speeches, hymns, paintings, novels, and school essays written by children themselves. They also examine texts intended specifically for children, including text books, catechisms, newspapers, songbooks, and children’s literature. 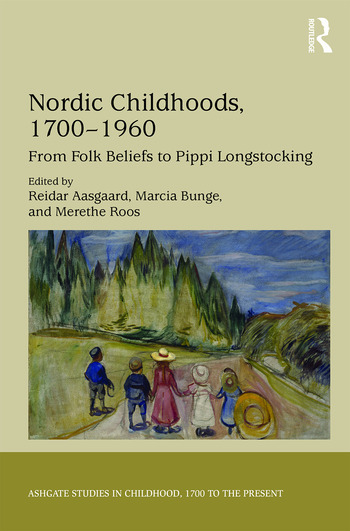 By bringing together scholars from multiple disciplines who raise distinctive questions about childhood and take into account a wide range of sources, the book offers a fresh and substantive contribution to the history of childhood in the Nordic countries between 1700 and 1960. The volume also helps readers trace the historical roots of the internationally recognized practices and policies regarding child welfare within the Nordic countries today and prompts readers from any country to reflect on their own conceptions of and commitments to children. Reidar Aasgaard is Professor of History of Ideas at the University of Oslo, Norway. Merethe Roos is Associate Professor of Education at Telemark University College, Norway.